You can enter our store and find Christmas decorations,here's a Christmas paradise. MENTION --Keep away from fire , the material is not fireproof ,it's dangerous to close the fire . --Don't inflate in rain ,the water could cause a short circuit . --Don't cover any stuffs on the inflator fan when used. --Don't allowed to run around the clock , suggest not using for more than 90 consecutive days. --Check the wires before use and unplug the power cable when it is not in use or you are leave. 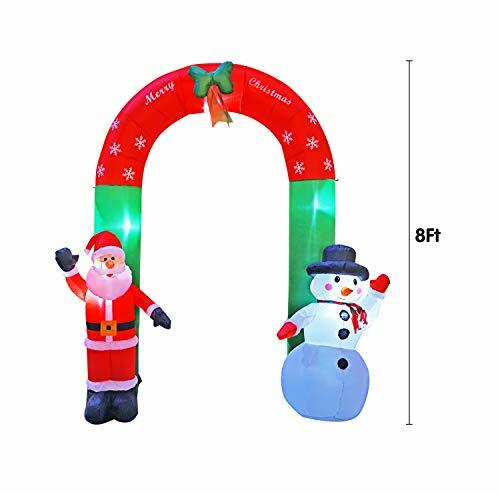 Snowman ,Santa Claus and other Christmas Decors are also very hot in our store .The Christmas Santa brings gift to your families and friends. Features --It's great for decorating in and out of the home. --It perfects for your nighttime display. It can also be a great part for your family photos. --The lightweight materials and self-inflating design make it easy for anyone in the family to setup and take down. --Easy Storage. Once deflated, it's compact design makes storage easy and allows it to be stored almost anywhere. --The weatherproof material is durable and waterproof, you can place it indoor and outdoor all the year round . Material: Polyester . Package Include : 1 x Arch , 1 x Blower ,4 x string ,4 x ground stake Attention --Keep away from fire , the material is not fireproof ,it's dangerous to close the fire . --Don't inflate in rain ,the water could cause a short circuit . --Don't cover any stuffs on the inflator fan when used. --Don't allowed to run around the clock , suggest not using for more than 90 consecutive days. --Check the wires before use and unplug the power cable when it is not in use or you are leave. 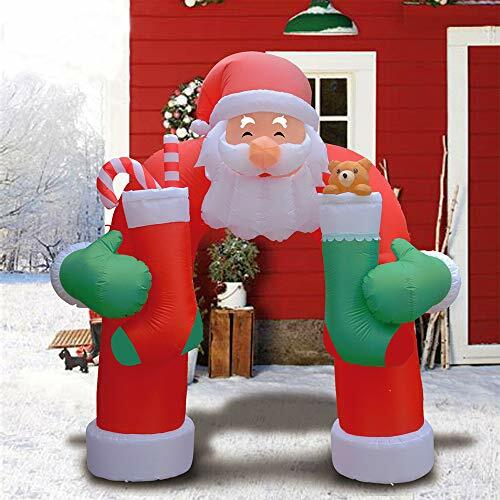 Specifications: Material: It is made of thickened waterproof polyester fabric,sturdy and wear-resistant.It has built-in fixed sandbags,fixed ropes and ground studs for fixing on the ground Size: 8 foot heigh,It has built-in super bright LED lights.Light it up at night to provide the best attraction for neighbors and guests Applicable Occasions: Garden,yard and more Package Included: 1 * 8 Foot Christmas Archway Descriptions: Christmas is coming,are you looking for something creative to decorate your garden? 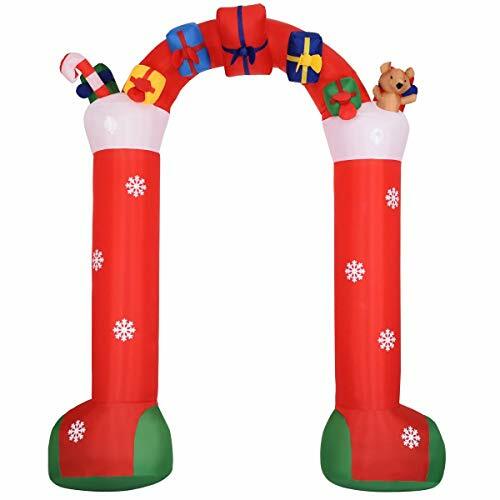 Here this christmas archway might be right for you. It is made of thickened waterproof polyester fabric,sturdy and wear-resistant. It has built-in fixed sandbags,fixed ropes and ground studs for fixing on the ground. This inflatable Christmas snowman is the perfect way to easily create your own winter wonderland. Perfect for indoor and outdoor decorations. So what are you waiting for? ORDER NOW! Note: Size may be 2cm/1 inch inaccuracy due to hand measure; Color may be little different due to monitor. There may be some smell, you can put it in a ventilated place for about a day or two. Please feel free to tell us if you have any question about our items or service. Thanks for your visit! 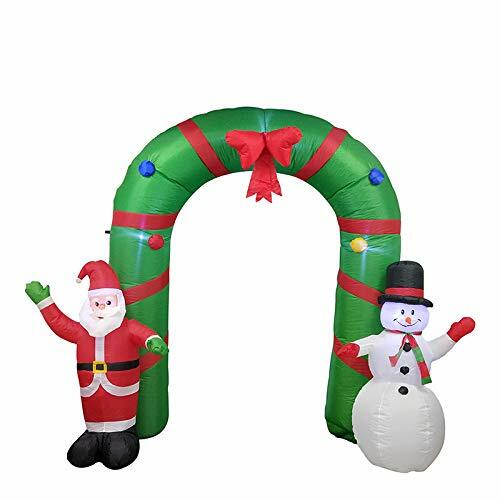 This year, make sure your holidays are larger than life with ALEKO's Large 8-Foot Christmas Inflatable Archway with a Waving Santa and Snowman. Let Saint Nick and Frosty lead the way to wintry fun: it inflates up to a full standing size in moments with the included UL certified air blower, and the embedded LED lights ensure visibility day or night. When the festivities are over, it's quick and easy to deflate for transport or storage. 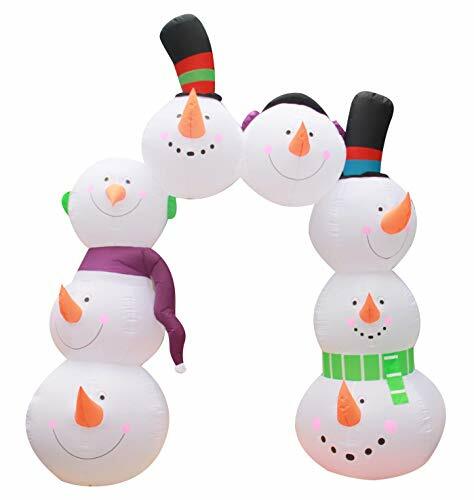 Durable, waterproof polyester construction makes this inflatable perfect for outdoor or indoor use, so your new friends will last for seasons to come. Includes everything you need to start building your winter wonderland today! 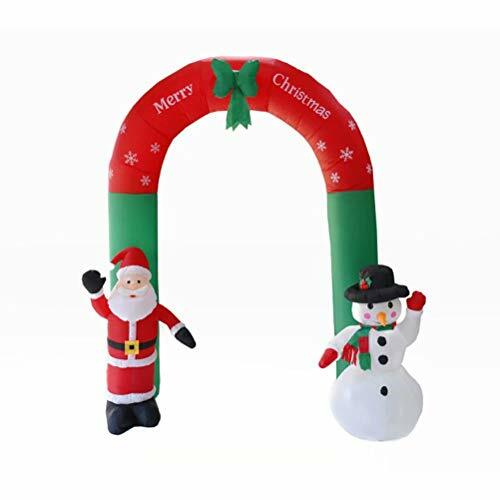 Snowman ,Santa Claus and other Christmas Decors are also very hot in our store .The Christmas Santa brings gift to your families and friends. Features --It's great for decorating in and out of the home. --It perfects for your nighttime display. It can also be a great part for your family photos. --The lightweight materials and self-inflating design make it easy for anyone in the family to setup and take down. --Easy Storage. Once deflated, it's compact design makes storage easy and allows it to be stored almost anywhere. --The weatherproof material is durable and waterproof, you can place it indoor and outdoor all the year round . Material: Polyester . Package Include : 1 x archway , 1 x Blower ,4 x string ,4 x ground stake Attention --Keep away from fire , the material is not fireproof ,it's dangerous to close the fire . --Don't inflate in rain ,the water could cause a short circuit . --Don't cover any stuffs on the inflator fan when used. --Don't allowed to run around the clock , suggest not using for more than 90 consecutive days. --Check the wires before use and unplug the power cable when it is not in use or you are leave. 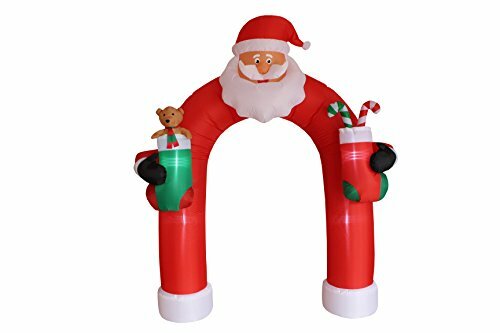 This adorable Inflatable Santa Claus Archway makes a great display on its own or paired with other inflatables to create a festive holiday scene. 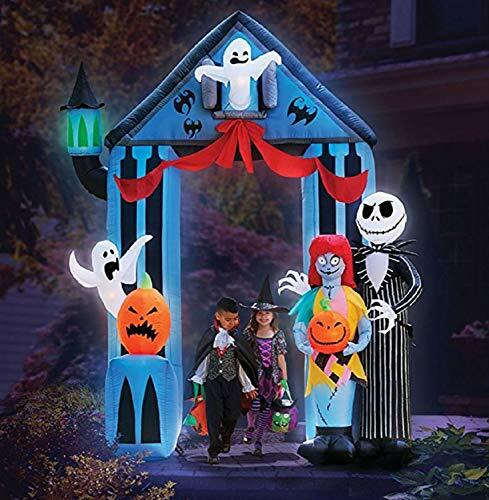 This Inflatable self-inflates in seconds and lights up so that friends and family can enjoy it day and night. Tethers and stakes are included to make sure it stays put, while the weather-resistant material ensures it will be around for holidays to come. Operation not recommended if temperatures drop below 14° Fahrenheit. (-10° Celsius). 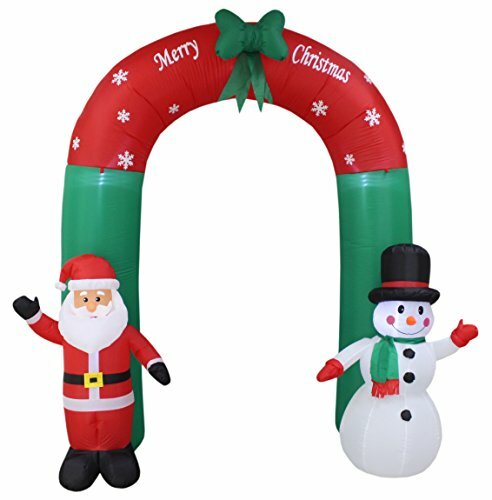 Greet guests and neighbors this holiday season with this adorable Lighted Inflatable Santa Claus and Snowman Archway. The green and red archway with green ribbon is a great way to welcome visitors your home. Easy to set up, it self-inflates in seconds and lights up for nighttime enjoyment. The weather-resistant material keeps it protected from the elements, while the included stakes and tethers keep it situated wherever you set it up. Operation not recommended if temperatures drop below 14° Fahrenheit. (-10° Celsius).